Leave your hotel in the morning. Admire the biodiversity of an astonishing protected area in Costa Rica as we drive by Braulio Carrillo National Park, a primary forest in 95% of its extension. Have a taste of our delicious Costa Rican breakfast en route. Be our special guest in a banana processing and packaging plant and learn more about one of Costa Rica's prime products (subject to availability). Enjoy a refreshing cocktail and a delicious Lunch as we welcome you to EVEGREEN LODGE. After lunch, we will visit the museum, the beach area and the small town of Tortuguero. A delightful dinner will be served upon arrival to the lodge. (B/L/D). Optional morning tour: Enjoy nature its best as you undertake a journey through the canals at dawn, and take your best short of a real Caribbean sunrise. 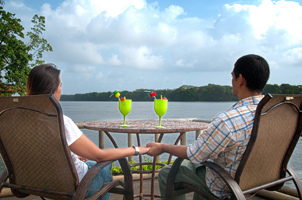 Discover Costa Rican flavors as you enjoy breakfast at EVERGREEN LODGE. Get ready to hike Tortuguero Hill or travel along the well known Tortuguero Canals and have the experience of your life in this unique paradise of magnificent flora and fauna. Enjoy a delicious lunch at the lodge. Take your time to enjoy our private trails, ride a boat through the canals or just relax. Optional night tour: Walk on the beach and admire the green turtles nesting (July through September). (B/L/D).